Are you familiar with the expression “too much to ask”? 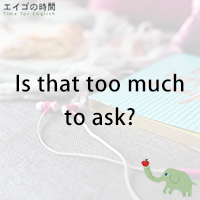 This phrase is often used in the form of a question. Is that too much to ask? When you say this phrase, make sure you sound frustrated because you’re supposed to be. You want something from somebody which seems to you quite simple and easy, but you don’t get it. Well, why don’t you come up with your own examples, if it’s not too much to ask. Next Post これ、知ってる？ – Are you familiar with this?